Home >Why Is Magento 2 Social Proof So Important? Why Is Magento 2 Social Proof So Important? In the previous post about 5 Magento 2 Social Proof Types To Increase Conversion, we’ve updated you on the definition and various practical ways to leverage your Magento 2 social proof. We hope that you find the sharing useful. Good content on your Magento 2 pages has a significant impact on how and why customers reach the final decision. The informative and emotional content promotes visitors to explore more while boring pages drive them out within seconds. Generally, marketers invest nearly 30% of their budget on improving content marketing. Internet users spend 20% of their time on content. 60% of customers are inspired to seek out the products after reading material about it. 70% of readers feel closer to one brand as a result of the content marketing. The information provided by your marketers is no longer enough. As a result, Magento 2 Social Proof is in effect to enrich your landing pages. Improve the product page with Magento Social Proof by reviews. Gather and show off Magento 2 Social Proof in the form of happy customers’ stores and testimonials. Those real-life experiences require no extra cost, yet very useful in emotionally inspiring new visitors to take actions. Make use of free Magento 2 user-generated-content such as product images by customers, customers product video, or advanced reviews to enhance Magento 2 Social Proof. Unlike buying from a brick-and-mortar store, people have more significant doubt and need more proof when shopping online. Customers have more faith in the opinions of other people than brands, so store owners need Magento 2 Social Proof. As “…if the more others are saying or doing something, the more correct it must be.”, Magento 2 Social Proof enhances the store’s credibility. Build trust – Build Magento Social Proof. 45% of online users have a preference for stores offering personalized recommendations. 85% buyers say that they trust reviews posted online as much as the personal suggestion. Customer reviews are 12 times reliable than the product description from the salespeople. Testimonials earn customers’ trust. What salespeople introduce about your business may be considered as the marketing action, but if your customers talk about it, it’s called Magento 2 social proof. Create a professional reputation by associating products with expert or celebrity endorsements. Turn your customers to your store advocates. Reviews, one more time, are the key factors. Obtain as many reviews as possible. What’s more, make those reviews more detailed and trustworthy with Magento 2 Advanced Reviews. Use product images and videos of the lovely customers as your Magento 2 Social Proof. Post them on your websites, your blogs, and your social channels to make products more real and believable. The more customers trust your sites thanks to Magento 2 Social Proof, the more likely they stay longer on your Magento 2 stores and take further actions. 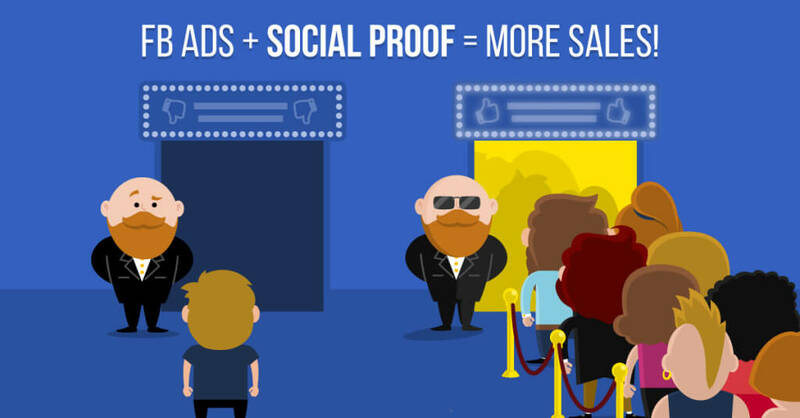 Facebook Ads – the perfect choice to make use of Magento Social Proof. Adding a photo which includes the portrait of customers/experts/celebrities improved the response in BaseCamp by 102.5%. There is a rise in customers’ engagement by 28% when they are exposed to a mixture of Magento 2 user-generated content and professional marketing content. Reviews and ratings shown on Magento websites increase conversion by 270%, especially for high-end products, the rate can be up to 380%. According to a Facebook case study, adding Magento user-generated content to social advertisements improves the CTR by 300%, and reduces both cost-per-acquisition and cost-per-click by 50% at the same time. 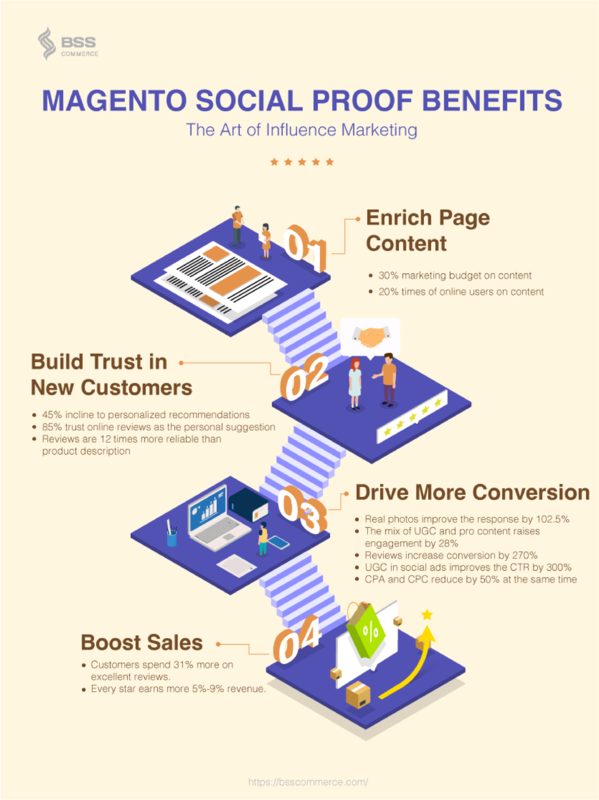 In short, how Magento 2 social proof impacts on your customers are the result of people promoting your business and the positive attitude of those Magento 2 UGC. The more, the merrier. “Man is a social being; it’s not surprising we love social proofs, it sells brands fast,” said Bernard Kelvin Clive – the famous brand specialist. When it comes to e-commerce business, Magento 2 social proof is even more important to generate more sales. Online shoppers reach your Magento 2 stores, and there is no salesperson to introduce them potential items directly. Hence, what other people experienced and shared about your stores works as the lead path to every step of the buyer’s journey: Awareness – Consideration – Decision. As a result of more trust and a higher conversion rate, your total bottom line will improve remarkably. Online shoppers are ready to spend an additional 31% of their budget on Magento website receiving excellent online reviews. With every star getting from Magento 2 social proof review, the revenue is expected to increase by 5%-9%. The astounding development of the Internet makes online shopping more accessible than ever before, which not only brings more and more potential customers but also results in fiercer competitiveness. Enhancing and placing Magento 2 Social Proof available in customers path will make the difference and help you earn a more substantial profit. Among various Magento 2 Social Types introduced in your post, customer reviews and product photos might be of the simplest ways to perform. Hence, we come up with Magento 2 Product Images by Customers extension and Magento 2 Advanced Review extension to ease your work. Want more useful blogs to digest ? BSS Commerce Magento Blog presents a great collection of Ecommerce and Magento-oriented, technical articles with the aim of sharing knowledge to enthusiastic store owners and developers.